Enter a list of distances. 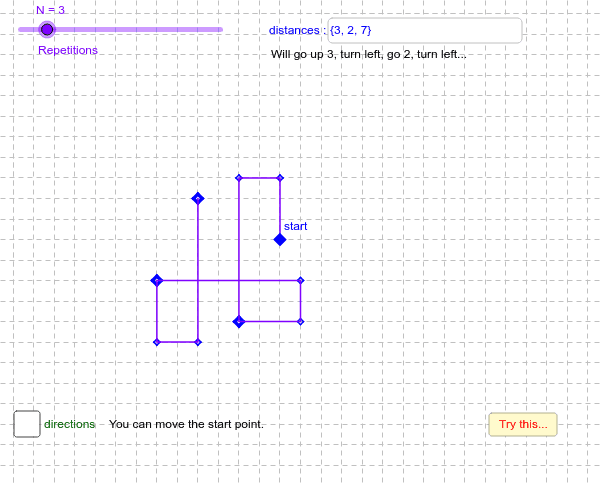 Draw a figure by going the first distance, then making a right angle turn left. Got the next distance, and turn again. When you've finished your list, you can go back to the first distance and continue. This is a great place for my favorite math question: what do you notice? I was reminded of these by this post: http://www.whatdowedoallday.com/2015/07/simple-spirolateral-math-art-for-kids.html This is a generalized version of an older sketch.